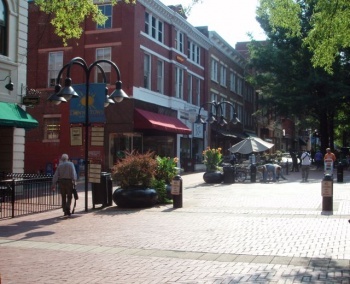 Charlottesville's Downtown Mall is one of the centerpieces of Charlottesville. Created in the 1970's and open to the public on July 3, 1976, the pedestrian walkway has become a tourist destination as well as a defining element of Charlottesville's civic culture. It is bordered on the west end by the Omni Hotel, and on the east end by the Charlottesville Pavilion. Graphic design: Jen Fleischer; Project Manager: Kristin Rourke. On July 21, 2008 voted to proceed with a design being shepherded by MMM Design. The City promised that the work would be done in five months beginning in January, with the project being overseen by construction management firm Barton Malow. Block captains volunteered to help the City develop a construction schedule that minimized the impact on businesses. See 2009 Mall Renovation Project for more details. ↑ Web. Charlottesville Mall Works for Downtown, Kathleen Brunet, News Article, Fredericksburg Free-Lance Star, Fredericksburg, Virginia, November 11, 1986, retrieved January 2, 2017 via Google newspaper archive. ↑ Web. Study of Main Street Mall Proposed by Chamber Unit, Staff Reports, Daily Progress Digitized Microfilm, Lindsay family, October 29, 1959, retrieved January 2, 2017 from University of Virginia Library. Print. October 29, 1959 page 19. ↑ Web. Mall a Reality for Downtown, Dana Gumb, News Article, Cavalier Daily, March 27, 1974, retrieved January 2, 2017 via Google newspaper archive. ↑ Web. Former Councilors Share Memories of Early Days of Downtown Mall, Sean Tubbs and Brian Wheeler, Charlottesville Tomorrow, April 13, 2010, retrieved January 2, 2017. ↑ Print: Physical Growth, Social Strain Mark City's Year, Peter Bacque, Daily Progress, World Media Enterprises January 4, 1976, Page D1. ↑ Print: The Seventies: Central Virginia Ends Decade of Joy and Tragedy, Doug Kamholz, Daily Progress, Worrell Newspaper group January 1, 1980, Page A6. ↑ Web. Charlottesville City Council meeting minutes, .pdf, Council Chambers, City of Charlottesville, April 21, 2003. ↑ Web. Charlottesville City Council OKs $100,000 for Downtown Mall risk and threat assessment, Chris Suarez, News Article, Daily Progress, May 22, 2018, retrieved May 28, 2018. ↑ Web. Mall ambassador program cut in proposed city budget, Lauren Berg, Daily Progress, World Media Enterprises, March 7, 2016, retrieved December 31, 2016. ↑ Web. Schematic Design Report for Charlottesville Downtown Mall, Wallace Roberts & Todd, May 2005, retrieved April 26, 2016. ↑ Web. Council agrees to half of $100,000 request for Downtown Mall marketing effort, Charlottesville Tomorrow, October 9, 2008, retrieved July 29, 2014. ↑ Web. City panel seeks more options for Downtown Mall seating, Sean Tubbs, News Article, Charlottesville Tomorrow, April 30, 2016, retrieved January 2, 2017. ↑ Web. Design panel denies backless benches for Downtown Mall, Sean Tubbs, News Article, Charlottesville Tomorrow, April 18, 2017, retrieved May 9, 2017. ↑ Charlottesville City Council Minutes, 6 Jan. 2003. City of Charlottesville, Virginia. Retrieved 14 Jun 2009. ↑ Web. Downtown Mall to be honored Thursday, Daily Progress Staff Reports, Daily Progress, World Media Enterprises, September 30, 2012, retrieved October 8, 2012. ↑ Web. Ambassadors a second set of eyes and ears on the Downtown Mall, Aaron Richardson, Daily Progress, World Media Enterprises, May 6, 2013, retrieved May 6, 2013. This page was last edited on 10 October 2018, at 20:03.